Speaker of the House of Representatives, Right Honourable Yakubu Dogara is a man in desperate need of help before he drowns in his own bile. His Hatred for President Muhammadu Buhari has crossed the bounds of obsession and now borders on being a religion, a pathetic belief that relevance in the contemporary Nigeria comprises chiefly of antagonizing PMB or going for the jugular of those that ae brave enough to identify with his anti-corruption war. Not even an event as hallowed as the inauguration of the new headquarters of the Economic and Financial Crimes Commission (EFCC) in Abuja some few days ago could provoke a sense of contrition in Dogara, who thought it was the best time to claim that President Buhari is not the only incorrupt Nigerian alive. True. There are millions of Nigerians that are incorrupt but those Nigerians are not in the legislature where the Speaker only speaks the language of sleaze. Had Dogara a tenth of President Buhari's global standing as an anti-corruption crusader and one percent of his commitment to root out official corruption Nigeria would have been on the mend at a faster rate than is currently the case. The Speaker, instead of supporting the President, has dedicated the better part of his career since June 2015 to undermining the collective resolve to do away with corruption before it sinks Nigeria. For him to put it in words that PMB is not the only 'incorrupt' person is therefore indicative that his attacks on persons fighting corruption is shifting to a higher gear, something that Nigerians should be worried about because Dogara has a host of House members that share not just his conviction that the country should continue to be corrupt but also share his fanatical passion for implementing this perverted thought pattern. Their mode of operation is to target the Chief Executives of government agencies that they know to be compliant with President Buhari's stance on fighting corruption and unleash multiprong attacks on them. They package this harassment of upright public office holders to appear like legitimate activities in pursuit of a better country so it is not unusual to read of probes, motions, public hearings and other engagements to which these chief executives are invited. In fact, there was the instance of a Director General of one government agency who blurted out to his associates that he was unable to do any meaningful work on account of constantly being summoned to appear before standing, ad-hoc and emergency committee of the House of Representatives – often over the same issue in most instances. The suggestion of these associates was for him to pay off the lawmakers, which is impossible because of his belief in the policy direction of his boss, the president, on corruption. In some cases, the pettiness of Dogara and his colleagues gets to bizarre levels, like the way they made a circus out of the fraud uncovered at the National Emergency Management Agency (NEMA). The NEMA boss, Engineer Mustapha Maihaja, found himself holding the slippery end of the stick for daring to expose the fraud that had been perpetrated at the agency prior to his assumption office as Director General. 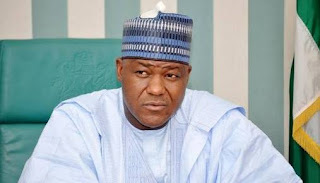 Logic suggests Maihaja should be acknowledged for his uprightness and contribution to the anti-corruption war, Dogara's new religion of obsession dictates that he must be hounded and made the accused in the fraud he uncovered. Maihaja has honoured several invitations before the House members and there seems to be no end in sight, he is but a few steps away from getting a permanent suit at the National Assembly when he ought to be hard at work providing relief across the country. The humorous part is that the directors he exposed as being thieves have not for once been invited by the same House but were instead rewarded by reinstatement from a befitting suspension for being indicted. It was this attempt at creating a soft landing for indicted treasury looters and the revelation that the House was being teleguided from some quarters that unravelled its investigation into NEMA. The foregoing highlights how the combination of Dogarous greed and obsession threatens not just the stability of the country but also the safety of Nigeria. First, it seems the lawmakers are totally disregard of the tendency of the offer of assistances from international bodies tend to mutate into loans that imperil future generations. Secondly, in an era where the dangers of genetically modified organisms (GMO) are still being hotly debated, it appears the lawmakers have no questions about accepting grains of uncertified origins as food Nigerians; even at the height of a food shortage in 2010, starving Zimbabweans rejected such tainted grains so why should Nigeria's Internally Displaced Persons (IDPs) be fed poison simply because an international organization is shipping it in. Of course, there was the issue of having to give the procured rice to WFP since it has the capacity to distribute and the lapses discovered to have occurred before Maihaja came into office, which Dogara and his goon must overlook simply because it will not give them the opening they are looking for to tear President Buhari down. They have become even more aggressive after their own public hearing have put facts in proper perspective because their religion of obsession has no room for being reasonable. Dogara and his co-travellers in this game of Buhari-hounding must learn one truth: that sometimes the frenzy of religious absorption becomes profound to a point that the genuine inner voice is drowned out. Their obsession with President Buhari has blinded them to their own loss of popularity with their own constituencies, which has set them up to fail in the 2019 elections except for the few that can still retrace their steps in time to avert the incoming self-inflicted defeat. The only door of salvation is to renounce the obsession and, as lawmakers, align with the wishes of the electorate, which is to support President Buhari's anti-corruption war.